Oasis has moved to Berkeley! We'll help you navigate the asylum process. Our mission: Oasis Legal Services proudly provides quality legal immigration services to under-represented low-income groups with a focus on LGBTQIA+ communities. By acknowledging, respecting, and honoring their struggles, we empower immigrants so that dignity grows and integrity blooms. Jesus and Jorge fled Mexico after facing discrimination, bullying and rejection for being gay. Jesus fled when he was 15 years old and Jorge fled when he was 18. The couple met at SF Gay Pride 2012 and married in 2016. Oasis legal staff member Maria Elena supported them from day one, thoroughly explaining the asylum process step by step. Since gaining asylum Jesus has gotten a better job and feels more free to be who he is, no longer hiding his sexual orientation. Jorge has a son born in the U.S. and now wakes up in the morning without fear of being caught in an ICE raid and separated from his son. Having lawful immigration status changes our clients' lives in a profound way. With legal status our clients can apply for social security numbers and come out of the shadows to work legally; they can pursue educational opportunities that would have been unlikely as undocumented immigrants; and with asylum they can access necessary medical and psychological services to be successful in a new culture and heal wounds from the past. Before he came to Oasis one of our clients who was trained as an architect in his home country had no choice but to work as a day laborer without any legal protections or benefits. Now that he has asylum he works at a successful architecture firm. LGBTQIA+ clients often feel an increased vulnerability and stay in the closet fearing deportation. With lawful status and access to employment, education, and health benefits, our clients can come out of the closet more fully and embrace their life and opportunities here in the United States. When our clients obtain asylum status they have the opportunity to become full participants in their communities, thereby also enriching the lives of those around them. Jorli faced many difficulties living in Mexico due to her sexual orientation, including humiliation and violent persecution. She fled to the US when she was 26. Her son Joseph was born here and is now in fourth grade. Before getting asylum, Jorli was always worried that she would be detained by ICE and there would be no one to pick Joseph up from school. 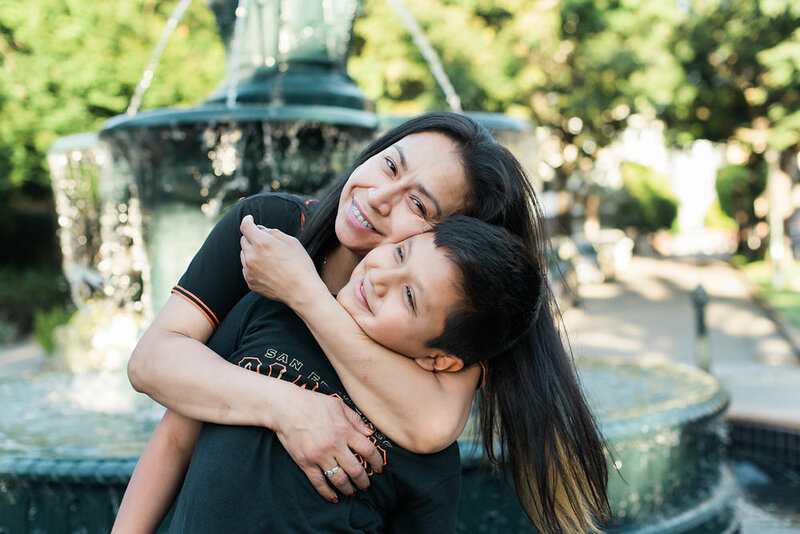 Now that she feels safe she no longer fears going out in public with her son, and they recently realized their long-time dream of going to a Giants game together. In many countries, LGBTQIA+ individuals suffer horrific violence due to homophobia, prejudice, ignorance and fear around gender orientation and identity. Those who are able to flee to the United States are eligible to apply for asylum and eventually they can become legal permanent residents and citizens. The LGBTQIA+ population on a global level is often one of the most vulnerable and yet invisible at the same time, so LGBTQIA+ asylum applicants often face additional levels of difficulties in an already complicated legal process. Due to the years of work within the LGBTQIA+ community on both professional and personal levels our staff is able to provide our clients with the most up-to-date immigration information and guide them through the process of applying for asylum in a safe and compassionate environment. Every year, an estimated 250 LGBTQIA+ immigrants in the Bay Area who are eligible for asylum are not able to obtain the legal services they need from non-profit organizations. * Many of them lose their chance at ever getting asylum. Private attorneys typically charge between $5,000 and $20,000 for an asylum case, which is out of reach for all but the most privileged immigrants. Non-profit organizations in the Bay Area do not have the capacity to serve all of the people who are eligible for asylum. Oasis seeks to provide low cost, affordable legal assistance to all Bay Area LGBTQIA+ asylum-eligible immigrants.